I recently came to a point where I needed a mannequin for some of the DRIFT scenes. So I immediately went on Amazon Japan to see what was available on a tight budget. 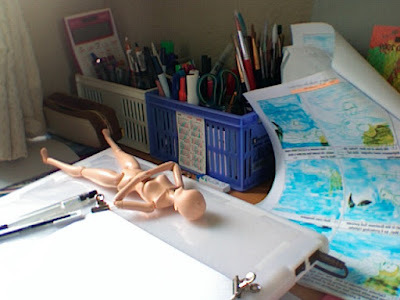 Unbelievably the fully bendable and detailed manga dolls were cheaper than normal clunky wood mannequins; and they were certainly easier to find. I started thinking that there may be a bit of difference between the stylized child bodies and the Pre-Raphaelite English Rose I am seeking to represent. Then again, maybe it isn't so much of a leap of ideas. The tragic child-woman of DRIFT could also quite possibly be a Manga Doll.